Portrait group. Inscribed on frame: "Mr. Charles. R. Mackintosh FRIBA The Architect/Col. R.J.Bennett V.D./Mr. David Barclay FRIBA/Sir Francis Powell, LLD, PRSW/Mr. John Munro FRIBA/Mr. Patrick S. Dunn - Convener/Councillor J. Mollison, MINA/ Mr. Hugh Reid DL/ Sir Wm Bilsland, Bart. LLD, DL/Sir John J. Burnet, RSA, FRIBA, LLD/Mr. John Henderson MA/Sir James Fleming - Chairman of Governors/Mr. John M. Groundwater - secretary/ Mr. Francis H. Newbery CAV OFF, INT, SBC, ARCA - Director, pinxit". When Newbery exhibited this group at the Glasgow Institute of the Fine Arts in 1913 it did not include the figure of Mackintosh. 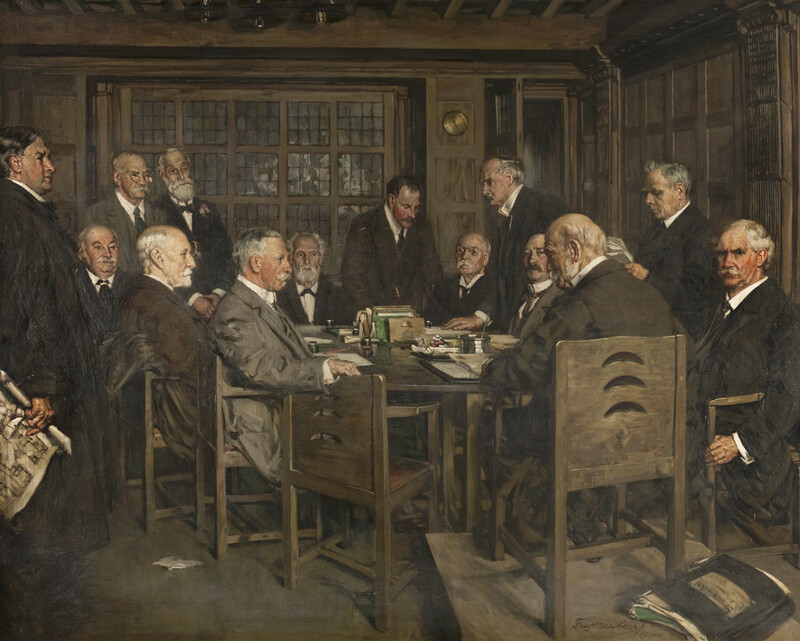 In 1914 he painted his large portrait of Mackintosh (collection: Scottish National Portrait Gallery) and his Building Committee portrait group was offered to the Board and accepted. When it was unveiled in 1914 it was seen that he had added Mackintosh's figure, a smaller version of his individual portrait, to the left of the group, and redated the whole canvas 1914. Painting cleaned and relined in 1963 by Mr Harry McLean who discovered the late addition of the figure of Mackintosh. Presented to Board of Governors by Francis Newbery, May 1914. The Scots Pictorial, May 30th 1914, p.230 Howarth, p317 Scottish Art Review XI No. 4, 1968, p.19 Apollo, Oct 1973, p286-93 fig.8. Rawson, 'Fra H Newbery: Artist and Art Educationist, 1855-1946', p.16 Rawson, 'Fra H Newbery: A Dorset Artist', p.15 McKenzie, 'The Flower and the Green Leaf',p.48.